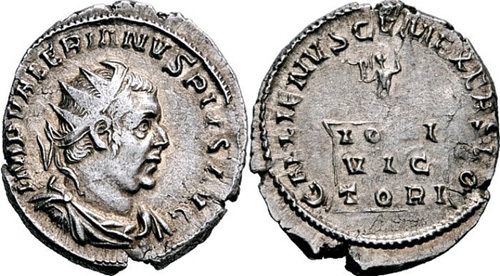 P. Licinius Valerianus was proclaimed Emperor by the troops whom he was leading against the usurper Aemilianus. Valerian proclaimed his son Gallienus Augustus. He was taken prisoner in 260 and passed the remainder oh his life in captivity. After death his skin was stuffed and long preserved as a trophy in the chief temple of the nation. Obverse: VALERIANVS P F AVG, Radiate, draped and cuirassed bust right. Reverse: DEO VOLKANO, Vulcan standing right within temple, holding pincers in left hand and hammer in right hand; anvil at feet to left. Obverse: IMP VALERIANVS PIVS AVG, Radiate, draped and cuirassed bust right. 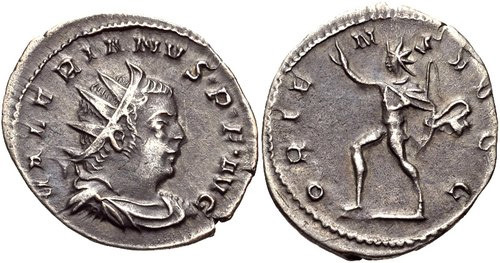 Reverse: GALLIENVS CVM EXERSVO, cippus inscribed IOVI VICTORI in three lines, surmounted by Jupiter standing slightly left, holding crowning Victory and scepter. Reverse: ORIENS AVGG, Sol walking left, right hand raised, left holding whip. Reverse: ORIENS AVGG, Sol standing facing, head left, holding globe and raising hand. Obverse: IMP P LIC VALERIANO AVG, Radiate, draped and cuirassed bust right. Reverse: VIRTVS AVG, Soldier standing left, holding Victory, spear and shield.